This is the third round of Vermont Roulette, wherein I drink a random Vermont beer I've never heard of, and see what happens. So far we've had one big success and one... not quite as good. 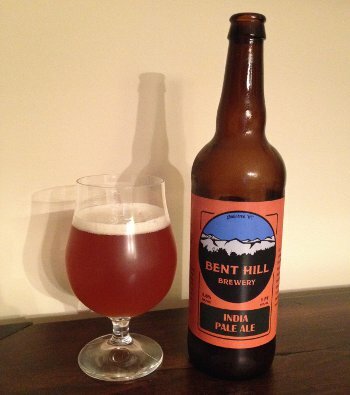 Bent Hill is a brand new brewery, having opened their doors in June, so information is a bit sparse. The founders were environmental engineers or somesuch, and thus have all sorts of grand plans, including an initiative to grow most of their hops locally and, as I generally presume of so-called "green" brewers, the creation of a weather control doomsday device. One thing is for certain: there is no stopping them. And I, for one, welcome our brewing overlords. I'd like to remind them that as a trusted blogging personality, I can be helpful in rounding up others to toil in their hop fields. Beer Nerd Details: 5.6% ABV bottled (22 oz. bomber). Drank out of a tulip glass on 9/5/14. Three rounds of Vermont Roulette, and I survive to play the final round, coming next week. Stay tuned. This page contains a single entry by Mark published on September 8, 2014 10:57 PM. Three Floyds Space Station Middle Finger was the previous entry in this blog. Floyd D'Rue is the next entry in this blog.